A night in the studio with a drum machine, and SG Guitar and Bass thinking of a new song idea. Session saved as 100106 in Protools. changed up drumbeats on the machine to see if it would give it a new angle. Titled:  - bridge idea 100106 on the audio album page. Titled:  - fav idea parts 100106 on the audio album page. Titled:  - instr at end 100106 on the audio album page. Mark suggested to Tom singing the part hard blues like clutch or old black sabbath. mark thought up a chorus part and sang a vocal line that Tom and him chanted together and carried the style over into the verse part. Titled:  - one more vocal 100106 on the audio album page. Titled:  - sassy vocal idea 100106 on the audio album page. on the bridge Mark looped it and said we should do sort of a whiny aggressive vocal idea. Titled: [1-7] - 100120 ideas vocally on the audio album page. Lyrics we were riffing on were "I'm just warming up my voice so I can do some things thats fun" and variations of that. Mark said we should change voice to hands and all the things we would do with them. Tom said that sounded dirty. Titled:  - 100120 ideas vocally FUN on the audio album page. Then added the the vocal part from earlier and sang the harmony with the Hands line instead. recorded - camera and Ustream of track Titled:  - 100120 ideas vocally3 on the audio album page. Tom and Mark mess with a looped part of the song for a vocal transition idea. Tom and Mark loop the chorus track to try out some vocal ideas. working on song structure in back warehouse. played the song live to figure out what it should do. 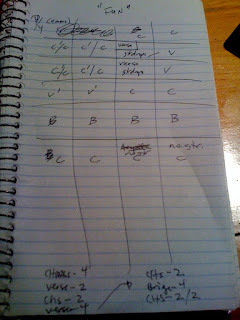 Discovered over the course of the writing that we had 4 parts written. 4th part is called B-Prime as its just the first section of the real b part repeating from the idea titled:  - 100120 ideas vocally FUN on the audio album page. from the previous 100120 practice session. For the a-part vocall we decided to go with the first version of the melody from the netcast shown here at 1:24min into it. start with warming up part (now the chorus). guitar starts playing verse, vocals continue with chorus lyrics and melody. r09_0047 audio take best yet on the audio recorder referenced in audio section of this post below. Song now tentatively called "Warming Up"
This is a really bad copy of the run through we did, recorded on a digital audio recorder. Using this take just as a reference. Working on the song parts we had so far with the rest of the band live in the studio. For fun Eric played his keys like Supertramp. Then tried to apply it to the chorus key and it sounded busy. Then Tom said to Eric to do more of a left right thing and that worked. Horn did what Bryan called classic fill in the blanks to the vocal response. Tried to hook a wah pedal up to the Wurlitzer but that didn't sound too good. Eric needs to lock his groove in like the bubble. Keys were doing the same rhythm thing as the chorus part and we thought it got too busy so we told Eric to spread it out more rather than as a rhythm. Bryan and Mark worked on him learning the guitar line to play with and Bryan added his own spin to it that turned pretty damn cool Bryan needs to remember to play sticato. On certain parts of the verse when Bryan and Mark quickened up the part Eric would follow up by doubling though. then the chorus after that which will just have drums bass and vocal will be in the normal key. 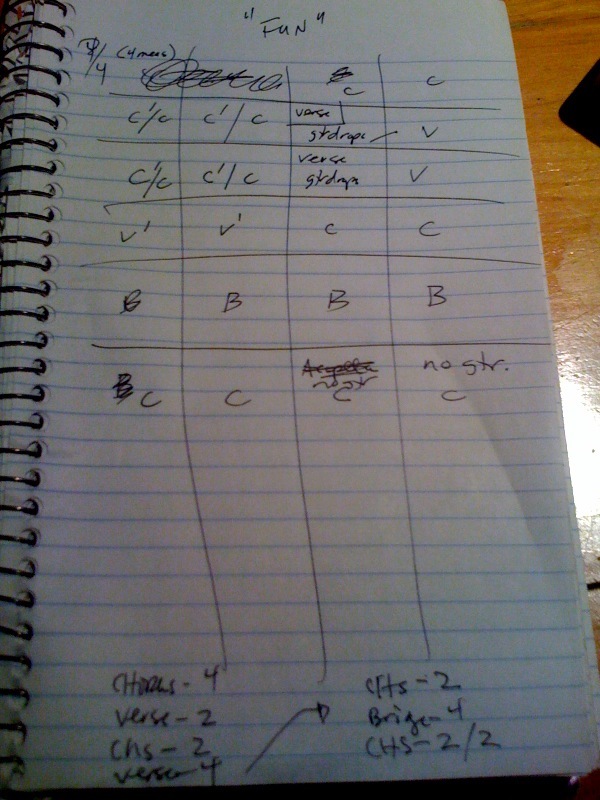 This is a compilation of the different parts we recorded through out the night arranged in the order the song should go. Recording guitar and bass over the structure file we cut last time. The notes we had from the previous post were not correct so we wrote them down listening to the hand held audio take. Recorded the song with vocals, bass and guitar. Mark used a room mic instead of the mic in front of the amp which gave it a brighter sound. Tried out different vocal harmonies and ideas over the track we just recorded. Working track for the EP with scratch vocals, bass and guitar. The concept we went for was looking up Fun on the thesaurus and the definition of the different words for it would be our lyrics, reworded by us for the song in a way we like. Song has now been titled "Fun"
Had Scott get on the kit and try and come up with a rhythm to replace the drum machine we've been working with. He laid a funky line and Eric played an equally funky Clav keyboard part with it. We were going to add this song to the EP but decided it needed more work to get it to where we wanted for release.